From yesterday’s national infrastructure report by the U.S. Department of Homeland Security. Red highlight by PP Blog. TelexFree — specifically the Ponzi- and pyramid complaint filed against it Tuesday by Massachusetts Commonwealth Secretary William Galvin — was the top story yesterday in the U.S. Department of Homeland Security’s daily infrastructure report. DHS was formed after the terrorist attacks of Sept. 11, 2001. Galvin alleged that TelexFree had gathered more than $1.2 billion in a massive, international fraud scheme. Yesterday’s infrastructure briefing singled out four “Top Stories” in the United States, with TelexFree listed at the top of the thumbnail reports. “The Massachusetts Securities Division charged TelexFREE Inc., with running a Ponzi scheme targeting Brazilian-Americans that has raised over $90 million from Massachusetts residents and around $1 billion globally,” the thumbnail read. Yesterday’s infrastructure report did not mention that DHS itself had a role in executing a search warrant and securing the premises of TelexFree’s headquarters in Marlborough, Mass. Agents were at the site Tuesday, the same day Galvin filed a state-level action and the SEC filed a federal action. An SEC affidavit credits DHS and a Bristol County Sheriff’s Deputy with stopping a bid by an accused TelexFree executive to remove nearly $38 million in cashier’s checks from the premises. The DHS infrastructure report is culled from various media reports. Although yesterday’s report highlighted four top stories across a broad spectrum, it also listed stories in various categories of infrastructure protection. 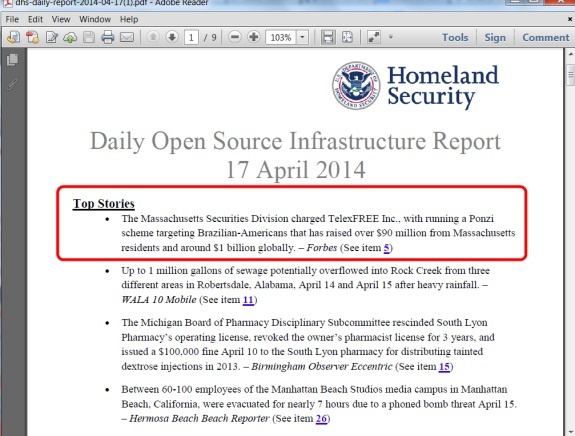 The DHS Daily Open Source Infrastructure Reports are available here. A group of Rwandans who had invested in the former Telex-Free Rwanda Ltd are considering legal action against the company in a bid to recover their money, The New Times has learnt. TelexFree Bankruptcy: How Can an Investor Get Their Money Back? No, it’s not a reload scam. It lists the addresses and how to file a proof of claim. Thank you for these, Tony. Would you like to know who made ? ?the payment in cash and will do to try to save a little money? Ain’t gonna publish your spam for Spinding. Not sure if you’re clueless or not. This is a thread about TelexFree, an alleged $1.2 billion Ponzi- and pyramid scheme that crossed national borders, caused problems at banks and is being discussed by the U.S. Department of Homeland Security.